If your preferred time is unavailable, please contact us. Mars Charters offers the only Direct Transfers from Hamilton Island to Palm Bay Resort. Only a 3 minute transfer from Hamilton Island Airport to our vessels, via Resort Link (or a 10min walk). No long bus rides, changing of vessel or multiple bus transfers - it only takes approximately 40 minutes from Hamilton Island! Do your shopping at the IGA supermarket on Hamilton Island when you arrive located at the top of our marina berth. 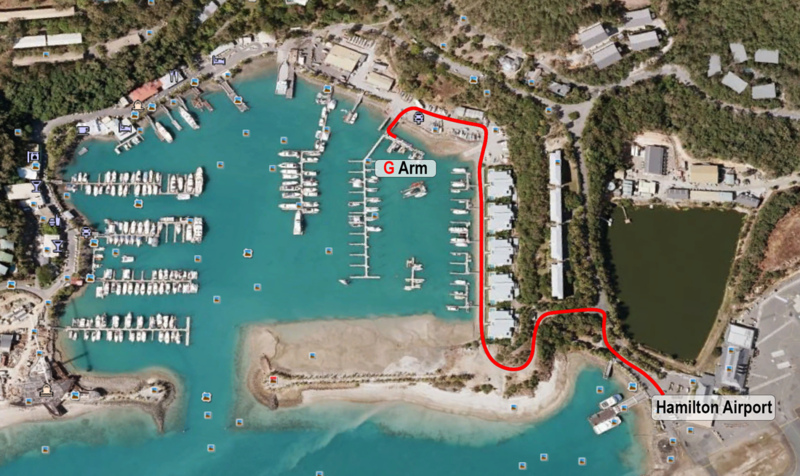 Palm Bay Water Taxi is located at Hamilton Island Marina, G Arm. For directions from Hamilton Island Airport, please see image to the left (approx. 10min walk). Alternatively you can jump on a 'Resort Link Taxi' to drop you off at a small charge per person. The IGA Supermarket is before the top of G arm, should you wish to do some shopping before your departure.